This is my favorite quilt of 2012. 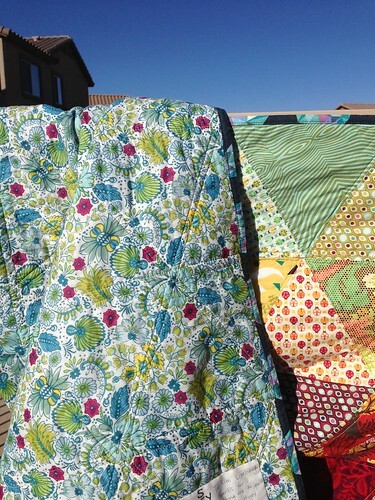 It started out as a stack of Tula Pink's then newest line, The Birds and the Bees. Tula Pink is one of my favorite fabric designers because she makes beautiful fabric that is also funny in that there are hidden images. And come on who doesn't love a little rainbow in their life?? I used a free online pattern by Anna Maria Horner, called Patchwork Prism. This quilt was a work in progress for quite a while. I remember I was cutting all the fabrics while Derek was watching the Mars Curiosity Rover land, (which I had to go look up) August 6th. 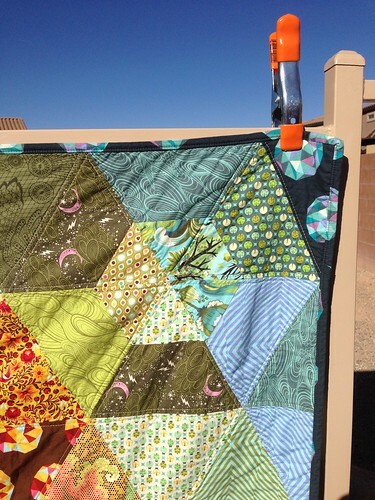 The quilt is backed in voile from Anna Maria Horner. I am an ardent spray baster, in that I use spray glue to hold my quilt layers together before and during the quilting process. And I have had no problems with it. But the voile is so silky that the glue does not make it stick to the batting. So I had to pin this quilt in the middle of quilting. So there are definitely unpretty areas on the back. 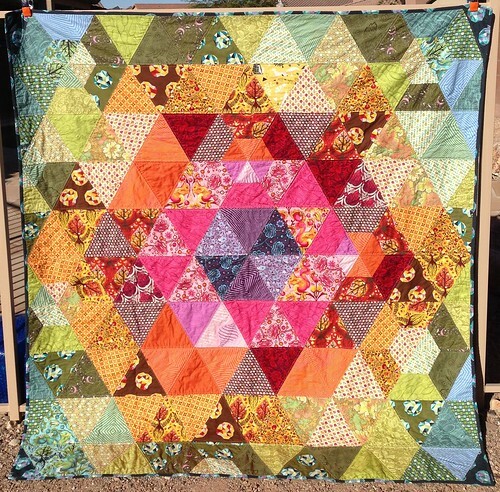 But even given that fact this is my favorite quilt of 2012.